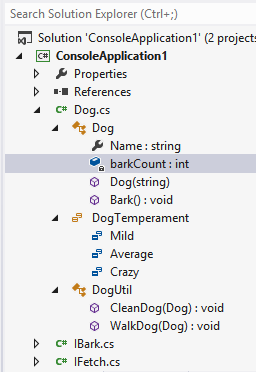 In Visual Studio 2012, you most often use Solution Explorer to see the files within your solutions and projects. Double-clicking on a file opens it in the code editor window. 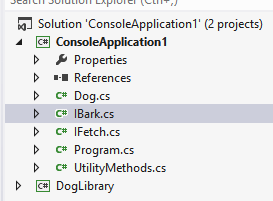 However, you can also see information about the types in your code, using the Solution Explorer. By using the little arrows to the left of each file, you can open up the file to see all of the types defined in the file. You can then drill down into each type to see all of its members. Double-clicking on a specific member will open the code editor window and navigate to the declaration of that member.